Seven participants started the follow-up phase earlier than day 74, having received 2 weeks of study drug during the open-label phase of the study. AE indicates adverse event; ECG, electrocardiogram; MDD, major depressive disorder; OL, open-label; QIDS-SR16, 16-item Quick Inventory of Depressive Symptoms–Self-Report; SAFER, State vs Trait, Assessibility, Face Validity, Ecological Validity, Rule of Three Ps; TRD, treatment-resistant depression; WBP, withdrawal by participant. aParticipants could have multiple reasons for being a screen failure. bParticipants entered the follow-up phase if they did not choose to withdraw from the study. Changes shown in periods 1 (A) and 2 (B). Period 2 consisted only of participants who had received placebo in period 1 and had moderate to severe symptoms (n = 28). Period 1 (days 1-8) and period 2 (days 8-15) are discussed in the Design section of the Methods and shown in the vertical axis of Figure 1. BL indicates baseline; 2H, 2 hours post dose. Error bars indicate SE. Period 1 (days 1-8), period 2 (days 8-15), open-label period (days 15-74), and the follow-up period (days 74-130) are discussed in the Design section of the Methods and shown in the vertical axis of Figure 1. BL indicates baseline; error bars, SE. The American Psychiatric Association. The American Psychiatric Association Practice Guideline on the Use of Antipsychotics to Treat Agitation or Psychosis in Patients With Dementia. http://psychiatryonline.org/doi/book/10.1176/appi.books.9780890426807. Published 2010. Accessed August 23, 2016. Guy W. ECDEU Assessment Manual for Psychopharmacology—Revised (DHEW Publ No ADM 76–338). Rockville, MD: US Department of Health, Education, and Welfare, Public Health Service, Alcohol, Drug Abuse, and Mental Health Administration, NIMH Psychopharmacology Research Branch, Division of Extramural Research Programs; 1976:218-222.
clinicaltrials.gov. A Double-Blind Study to Assess the Efficacy and Safety of Intranasal Esketamine for the Rapid Reduction of the Symptoms of Major Depressive Disorder, Including Suicide Ideation, in Participants Who Are Assessed to Be at Imminent Risk For Suicide. NCT02133001. https://clinicaltrials.gov/ct2/show/NCT02133001. Accessed November 6, 2017.
clinicaltrials.gov. A Study of Intranasal Esketamine Plus an Oral Antidepressant for Relapse Prevention in Adult Participants With Treatment-resistant Depression (SUSTAIN-1). NCT02493868. https://clinicaltrials.gov/ct2/show/NCT02493868. Accessed November 1, 2017. Question Is intranasal esketamine hydrochloride an efficacious treatment option for patients with treatment-resistant depression? Findings In this randomized, double-blind clinical trial of 67 adults with treatment-resistant depression, significant improvement of depressive symptoms, assessed by the Montgomery-Åsberg Depression Rating Scale total score, was observed after 1 week with intranasal esketamine, 28 to 84 mg administered twice weekly, with a significant ascending dose-response relationship. Improvement appeared to be sustained with reduced dosing frequency for up to 9 weeks. Meaning Results of this first clinical trial of intranasal esketamine for treatment-resistant depression support study in larger trials. Importance Approximately one-third of patients with major depressive disorder (MDD) do not respond to available antidepressants. Objective To assess the efficacy, safety, and dose-response of intranasal esketamine hydrochloride in patients with treatment-resistant depression (TRD). Design, Setting, and Participants This phase 2, double-blind, doubly randomized, delayed-start, placebo-controlled study was conducted in multiple outpatient referral centers from January 28, 2014, to September 25, 2015. The study consisted of 4 phases: (1) screening, (2) double-blind treatment (days 1-15), composed of two 1-week periods, (3) optional open-label treatment (days 15-74), and (4) posttreatment follow-up (8 weeks). One hundred twenty-six adults with a DSM-IV-TR diagnosis of MDD and history of inadequate response to 2 or more antidepressants (ie, TRD) were screened, 67 were randomized, and 60 completed both double-blind periods. Intent-to-treat analysis was used in evaluation of the findings. Interventions In period 1, participants were randomized (3:1:1:1) to placebo (n = 33), esketamine 28 mg (n = 11), 56 mg (n = 11), or 84 mg (n = 12) twice weekly. In period 2, 28 placebo-treated participants with moderate-to-severe symptoms were rerandomized (1:1:1:1) to 1 of the 4 treatment arms; those with mild symptoms continued receiving placebo. Participants continued their existing antidepressant treatment during the study. During the open-label phase, dosing frequency was reduced from twice weekly to weekly, and then to every 2 weeks. Main Outcomes and Measures The primary efficacy end point was change from baseline to day 8 (each period) in the Montgomery-Åsberg Depression Rating Scale (MADRS) total score. Results Sixty-seven participants (38 women, mean [SD] age, 44.7 [10.0] years) were included in the efficacy and safety analyses. Change (least squares mean [SE] difference vs placebo) in MADRS total score (both periods combined) in all 3 esketamine groups was superior to placebo (esketamine 28 mg: −4.2 [2.09], P = .02; 56 mg: −6.3 [2.07], P = .001; 84 mg: −9.0 [2.13], P < .001), with a significant ascending dose-response relationship (P < .001). Improvement in depressive symptoms appeared to be sustained (−7.2 [1.84]) despite reduced dosing frequency in the open-label phase. Three of 56 (5%) esketamine-treated participants during the double-blind phase vs none receiving placebo and 1 of 57 participants (2%) during the open-label phase had adverse events that led to study discontinuation (1 event each of syncope, headache, dissociative syndrome, and ectopic pregnancy). Conclusions and Relevance In this first clinical study to date of intranasal esketamine for TRD, antidepressant effect was rapid in onset and dose related. Response appeared to persist for more than 2 months with a lower dosing frequency. Results support further investigation in larger trials. Research on mood disorder pathophysiology implicated abnormalities in glutamatergic transmission, along with synaptic and dendritic atrophy, in neural circuits that modulate emotional behavior.11 Several studies have shown antidepressant efficacy with the N-methyl-d-aspartate (NMDA) receptor antagonist, ketamine.12-17 One limitation of ketamine for treating depression is that it may require intravenous administration, reducing its applicability in outpatient settings. Esketamine, the S-enantiomer of ketamine, has a higher affinity for the NMDA receptor than the R-enantiomer18 and is being developed as an intranasal formulation for therapy in treatment-resistant depression (TRD). Rapid onset of antidepressant effects has been observed following intravenous administration of esketamine.19 We report findings from a study of intranasal esketamine, assessing its efficacy and safety compared with placebo in individuals with TRD. All participants had TRD, defined as inadequate response to 2 or more antidepressants (assessed by Massachusetts General Hospital Antidepressant Treatment Response Questionnaire21), with at least 1 inadequate response in the current depression episode. Otherwise, an antidepressant failure from a prior episode was acceptable. All participants continued the antidepressants they were receiving at study entry during the trial. At screening and before the dose on day 1, eligible participants had a score of 34 or more on the 30-item, clinician-rated Inventory of Depressive Symptomatology,22,23 corresponding to moderate to severe depression. 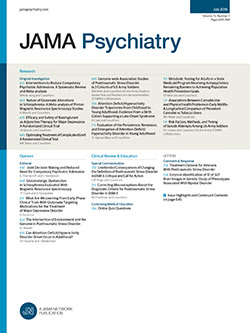 Key exclusion criteria included recent or current suicidal ideation with intent to act, suicidal behavior, or homicidal ideation or intent, diagnosis of bipolar or related disorders, intellectual disability, psychotic disorder, MDD with psychosis, posttraumatic stress disorder, obsessive-compulsive disorder, substance/alcohol use disorders in the past year, and recent use of cannabis (more inclusion/exclusion criteria reported in the eAppendix in Supplement 1). Independent review boards (United States: Sterling Institutional Review Board, University of Pennsylvania Institutional Review Board, Hartford Healthcare Institutional Review Board, and Western Institutional Review Board) and an independent ethics committee (Belgium: Ethisch Comité O.L. Vrouwenziekenhuis) approved the study protocol and amendments. The study was conducted in accordance with ethical principles that have their origin in the Declaration of Helsinki,24 consistent with Good Clinical Practices and applicable regulatory requirements. All individuals provided written informed consent before participating in the study. Financial compensation was provided. This phase 2, 2-panel, double-blind, doubly randomized, delayed-start,25-28 placebo-controlled study (a variant of sequential parallel comparison design27-36) was conducted from January 28, 2014, to September 25, 2015. In panel A, reported herein, 14 study sites (13 in the United States, 1 in Belgium) enrolled participants. The study protocol is available in Supplement 2. The study consisted of 4 phases: (1) screening; (2) double-blind treatment (days 1-15), composed of two 1-week periods (period 1, period 2); (3) optional open-label treatment (days 15-74) with tapering of intranasal dosing frequency; and (4) posttreatment follow-up (8 weeks). Based on prior studies of ketamine in which efficacy was reported after 1 to 2 doses, the duration of each period in the double-blind phase was 1 week, during which time it was expected that efficacy could be achieved. This design allowed evaluation of the dose(s) needed to proceed to evaluation in phase 3. The purpose of the open-label, flexible-dose phase was to evaluate the effect of less-frequent dosing on sustaining efficacy. At the beginning of double-blind period 1, eligible participants were randomized (3:1:1:1) to intranasal placebo or esketamine 28, 56, or 84 mg, twice weekly (days 1 and 4) based on the first of 2 computer-generated randomization schedules (period 1 and period 2). Randomization was balanced by using randomly permuted blocks and stratified by study center. At the end of period 1, those randomized to placebo who had moderate to severe symptoms (assessed by the 16-item Quick Inventory of Depressive Symptomatology-Self Report23,37 [QIDS-SR16] total score: moderate, 11-16; severe, >16) were rerandomized (1:1:1:1) to intranasal esketamine 28, 56, or 84 mg or placebo twice weekly (days 8 and 11); those having mild or no symptoms continued placebo. To maintain the blinding, all participants completed an identical process before entry into period 2, whether or not they were rerandomized. Regardless of response in the double-blind phase, all participants were eligible to enter the optional open-label phase. Esketamine, 56 mg, was administered on the first day of the open-label phase (study day 15); subsequent doses could be adjusted (range, 28-84 mg) based on the investigator’s clinical judgment, with administration twice weekly for the first 2 weeks, weekly for the next 3 weeks, then every 2 weeks thereafter. Study drug was provided in a disposable nasal spray device containing 200 μL of solution (ie, 2 sprays). Each device delivered either esketamine hydrochloride, 16.14 (14 mg of esketamine base) per 100-μL spray or placebo. To maintain blinding, the placebo solution (intranasal solution of water for injection) had a bittering agent (denatonium benzoate) added to simulate the taste of esketamine intranasal solution. As described above, the antidepressant that participants had been receiving immediately before study entry was continued unchanged. On each dosing day during the double-blind phase, participants self-administered 1 spray of study drug (esketamine or placebo) into each nostril at 3 points, each separated by 5 minutes. In the open-label phase, depending on the dose selected, participants self-administered 1 spray of esketamine into each nostril at 1, 2, or 3 points (corresponding to 28, 56, or 84 mg, respectively), each separated by 5 minutes. Overall illness severity was assessed on the Clinical Global Impression of Severity scale.40 Participants assessed their severity of anxiety on the Generalized Anxiety Disorder 7-item scale41 (eTables 1 and 2 in Supplement 1). Adverse events were monitored throughout the study. Other safety assessments (ie, laboratory tests, vital signs, physical examination) were performed at prespecified time points. Vital signs, the Clinician Administered Dissociative States Scale (CADSS),42 and the 4-item positive symptom subscale from the Brief Psychiatric Rating Scale43 were assessed predose, at 40 minutes, and 2 hours postdose. Efficacy data were analyzed in intent-to-treat analysis sets for each period and phase. The intent-to-treat analysis sets included all participants who received at least 1 dose of study medication during that period or phase and had baseline and at least 1 postbaseline MADRS total score within that period or phase. Safety data were analyzed in period 1, period 2, double-blind, and open-label data sets for all participants receiving at least 1 dose of study medication. The primary efficacy end point—change from baseline (predose, day 1 in each period) to end point (day 8 in each period) in MADRS total score—was analyzed using the analysis of covariance model. For period 1, the model included treatment and country as factors and baseline MADRS total score as a covariate. For period 2, the model included treatment and country as factors, period 2 baseline QIDS-SR16 score (moderate or severe), and period 2 baseline MADRS total score as a continuous covariate. Sample size was determined based on the following differences between intranasal esketamine and placebo for mean change from baseline in MADRS total score: 9-point treatment difference was assumed for period 1 (day 8), 7-point treatment difference for period 2 (day 15) was assumed for individuals with a moderate QIDS-SR16 score, and 9-point treatment difference for period 2 (day 15) was assumed for individuals with a severe QIDS-SR16 score. Based on the results of an intravenous esketamine study,19 it was estimated that 40% of placebo-receiving participants would have a moderate QIDS-SR16 score and 55% would have a severe QIDS-SR16 score at the end of period 1 (day 8 predose). Additional assumptions for the sample size calculation included SD of 10, 92.5% power for the combined data from day 8 and day 15,45 overall 1-sided significance level of .05, and 5% dropout rate for period 1. It was calculated that this panel of the doubly randomized, outcome-based design required 60 individuals to be randomly assigned to treatment on day 1 in a 3:1:1:1 ratio (30 in the placebo group and 10 per intranasal esketamine dose group). Statistical analysis was performed using SAS, version 9.2 (SAS Institute Inc). A total of 126 individuals were screened, 67 of whom met the eligibility criteria and were randomized (38 women, mean [SD] age, 44.7 [10.0] years). Of 33 participants randomized to placebo in period 1, 28 (85%) had a QIDS-SR16 score of 11 or higher at the end of period 1 and thus were randomly reassigned to esketamine or placebo in period 2 (Figure 1). Most randomized participants (63 of 67 [94%]) completed period 1 and the 2-week double-blind phase (ie, periods 1 and 2 combined, 60 of 67 [90%], hereafter termed completers). Of these completers, 57 entered the open-label phase, with 51 (89%) subsequently entering the follow-up phase, 41 (80%) of whom completed the week 8 follow-up visit. The treatment groups were similar with respect to demographic and baseline clinical characteristics (eTable 3 in Supplement 1). Forty-three (64%) participants reported only 1 antidepressant treatment failure in the current episode (in addition to 1 in prior episodes), 15 (22%) had 2 treatment failures, and 9 (13%) reported 3 or more antidepressant failures. Twenty-six (39%) participants reported use of atypical antipsychotics as an adjunctive treatment of MDD before study entry. The mean MADRS total score decreased from baseline to day 8 in period 1 and from day 8 to day 15 in period 2 in all groups, with greater improvement in all esketamine dose groups compared with placebo (least squares mean difference ranging from −5.0 to −10.5 in period 1 and from −3.1 to −6.9 in period 2) (Table 1). Change from baseline in the MADRS total score was statistically significantly greater in all 3 esketamine groups than in the placebo group after 1 week of treatment; the ascending dose-response relationship also was significant. Response was rapid in onset (Figure 2; eFigure 1 in Supplement 1) and appeared to increase over time during repeated dosing, as evidenced by a decrease in the mean MADRS total score during the open-label phase (mean [SE] change from open-label baseline to day 74, −7.2 [1.84]). In addition, improvement in mean MADRS ratings persisted over the 8-week follow-up phase (without additional esketamine doses) in participants who remained in the study (Figure 3). For completers who received 2 weeks of the same treatment in the double-blind phase, the mean decrease in the MADRS total score was greater in each esketamine dose group compared with placebo at day 15, with the magnitude of decrease directly related to dose (treatment differences relative to placebo of −12.5, −8.3, and −6.0 for esketamine 84 mg, 56 mg, and 28 mg, respectively). Efficacy appeared to be better sustained between drug administrations with the 2 higher doses (Figure 1). Among those who received the same treatment for both periods and completed the double-blind phase, the proportion of responders (defined as ≥50% improvement from baseline in MADRS total score) in each esketamine dose group was numerically higher than in the placebo group at the period 2 end point (28 mg: 38% [3 of 8], 56 mg: 36% [4 of 11], 84 mg: 50% [5 of 10], and placebo: 10% [1 of 10]). A similar trend for remission (defined as MADRS total score ≤10) was observed across groups. Among completers who received the same treatment in both periods, more participants who received the 2 higher esketamine doses compared with placebo achieved remission after 2 weeks of treatment (13% [1 of 8], 27% [3 of 11], and 40% [4 of 10] in the 28-mg, 56-mg, and 84-mg groups, respectively, and 10% [1 of 10], in the placebo group). Response and remission rates at the end of the open-label and follow-up phases are presented by type of treatment in the double-blind and open-label phases in Table 2. Three of 56 (5%) esketamine-treated participants during the double-blind phase (compared with none receiving placebo) and 1 of 57 (2%) during the open-label phase had adverse events leading to discontinuation of the study drug (1 event each of syncope, headache, dissociative syndrome, and ectopic pregnancy). During the double-blind phase, the 3 most common treatment-emergent adverse events observed among esketamine-treated participants were dizziness, headache, and dissociative symptoms; the frequency of each was more than 2-fold higher for esketamine than for placebo (eTable 4 in Supplement 1). A dose-response trend was noted for dizziness and nausea, but not for other adverse events. The type and frequency of adverse events reported in the open-label phase were similar to those in the double-blind phase; events reported for more than 10% of 57 open-label participants included dizziness (22 [39%]), dysgeusia (13 [23%]), nausea (9 [16%]), headache (8 [14%]), and sedation (6 [11%]). Overall, 14 of 57 (25%) participants reported transient dissociative symptoms. Most adverse events occurring on dosing days were transient and either mild or moderate in severity. No death was reported. Most of the esketamine-treated participants manifested transient elevations in blood pressure (maximum mean change: systolic, 19.0 mm Hg; diastolic, 10.3 mm Hg) and heart rate (maximum mean change: 9.4 bpm) on dosing days. Maximum blood pressure values were observed in most cases at 10 or 40 minutes after the dose (systolic: 199 mm Hg; diastolic: 115 mm Hg); elevated values typically returned to the value observed before dosing by 2 hours after the dose (eFigures 2 and 3 in Supplement 1). A dose effect was not observed for heart rate, although the greatest mean increases from baseline during both periods were observed in the 84-mg esketamine group. Perceptual changes and/or dissociative symptoms, as measured by the CADSS, began shortly after the start of intranasal dosing, peaked at approximately 30 to 40 minutes, and resolved by 2 hours (eFigure 4 in Supplement 1). Perceptual changes/dissociative symptoms attenuated in all dose groups with repeated dosing. No participant manifested symptoms suggestive of psychosis based on the Brief Psychiatric Rating Scale positive assessment. We observed a significant and clinically meaningful treatment effect (vs placebo) with 28-mg, 56-mg, and 84-mg doses of esketamine, as evidenced by change in the MADRS total score, with a significant relationship between esketamine dose and antidepressant response observed after 1 week of treatment. Duration of efficacy appeared to be shorter with the 28-mg dose administered twice weekly. Results from the open-label phase suggest that improvement in depressive symptoms can be sustained with lower frequency (weekly or every 2 weeks) of esketamine administration. The size of the medication-placebo difference was substantial from baseline to 1 week and was larger than the mean difference from placebo seen at 6 to 8 weeks in antidepressant studies in the US Food and Drug Administration database.46 The majority of participants maintained improvement over the 2-month follow-up phase. In what we believe to be the first study of intranasal esketamine for TRD, efficacy and safety were compared with placebo using a double-blind, doubly randomized, delayed-start design.25 This design allowed for a smaller sample size to assess efficacy, dose-response, and safety than a standard parallel-group design, while preserving a low chance of type 2 error to avoid missing the efficacy signal. The key aim of the design was to include only placebo-receiving participants from period 1 who required treatment in period 2 and to rerandomize them to receive 1 of 3 intranasal esketamine doses or intranasal placebo. At the end of the trial, efficacy data from both randomizations (day 1 and day 8) were combined in an integrated analysis. Given the rerandomized placebo, nonresponders were expected to have a lower placebo response; this approach was used to mitigate high placebo responses observed in psychiatric clinical trials.25 The consistency in results obtained from the period 1 and period 2 samples supports their combination using weights as discussed by Chi et al,25 although caution is required in interpretation due to the small sample size. In general, the esketamine doses evaluated in this study (28, 56, and 84 mg) appeared to be safe, with no new or unexpected safety concerns observed. Overall, transient increases in blood pressure after the dose, particularly increases in systolic blood pressure, support an increase in cardiac output as the underlying mechanism, consistent with previous reports for ketamine.15 Analysis of perceptual change symptoms (measured by CADSS assessment) suggests that onset begins shortly after initiation of esketamine and resolution occurs by 2 hours after administration. These symptoms were dose dependent and attenuated with repeated administration. In contrast, antidepressant efficacy did not attenuate across administrations. Generalizability of the study findings is limited by the small sample size and enrollment criteria that excluded individuals with a history of psychotic symptoms, substance/alcohol use disorders, recent use of cannabis, or significant medical comorbidities. Also excluded were individuals having current suicidal ideation with intent—a group that was evaluated in a separate study.48 Difficulty blinding esketamine, despite adding a bittering agent to placebo to mimic the taste of esketamine, is another limitation. Corresponding Author: Ella J. Daly, MD, Department of Neuroscience, Janssen Research & Development, LLC, 1125 Trenton-Harbourton Rd, Titusville, NJ 08560 (edaly2@its.jnj.com). Accepted for Publication: October 16, 2017. Author Contributions: Drs Daly and Singh contributed equally to the study, had full access to all the data in the study, and take responsibility for integrity of the data and the accuracy of the data analysis. Study concept and design: Daly, Singh, Fedgchin, Lim, Shelton, Thase, Van Nueten, Drevets. Drafting of the manuscript: Daly, Singh, Lim, Shelton, Drevets. Statistical analysis: Singh, Cooper, Lim. Obtained funding: Singh, Van Nueten, Drevets. Administrative, technical, or material support: Singh, Fedgchin, Shelton, Winokur, Manji. Study supervision: Singh, Van Nueten, Manji, Drevets. Conflict of Interest Disclosures: Drs Daly, Singh, Fedgchin, Cooper, Lim, Van Nueten, Manji, and Drevets are employees of Janssen Research & Development, LLC and hold company stock/stock options. Dr Manji holds a patent, which is assigned to Icahn School of Medicine at Mount Sinai, Yale University, and the National Institutes of Health; no financial benefit was received from this patent. Drs Shelton, Thase, and Winokur report no conflicts. Funding/Support: This study was funded by Janssen Research & Development, LLC. Role of the Funder/Sponsor: Employees of the sponsor were involved in design and conduct of the study; collection, management, analysis, and interpretation of the data; preparation, review, or approval of the manuscript; and decision to submit the manuscript for publication. Meeting Presentations: The study was presented at the 54th Annual Meeting of the American College of Neuropsychopharmacology; December 6, 2015; Hollywood, Florida; American Society of Clinical Psychopharmacology 2015 Annual Meeting; June 22, 2015; Miami, Florida; and Society of Biological Psychiatry 71st Annual Meeting; May 12, 2016; Atlanta, Georgia. Additional Contributions: Sandra Norris, PharmD (Norris Communications Group LLC), provided medical writing assistance and was compensated for her time by Janssen Research & Development LLC. Ellen Baum, PhD (Janssen Research & Development, LLC), provided additional editorial support. We thank the study participants and the investigators for their participation in this study: Belgium: Geert DeBruecker, MD; United States: California: David Walling, PhD; Florida: Mary Stedman, MD; Georgia: Robert Riesenberg, MD; Illinois: Mark Lerman MD; John Sonneberg PhD; Maryland: Robert Litman, MD; New York: Maha Ahmad, MD; Ronald Brenner, MD; Pennsylvania: Paul Gross, MD; and, Tennessee: Valerie Arnold, MD. There was no financial compensation.